Maintenance module (MM) is designed to control serviceability, diagnostics and renewal of Line Replacement Units LRU) being incorporated in the Radar: digital, digital-to-analog and analog cells; high frequency units and subunits; PCBs and secondary power supply units. WS-1 is made applying the automated diagnostic complex and is completed with multi-purpose programmer "UNIPROG". 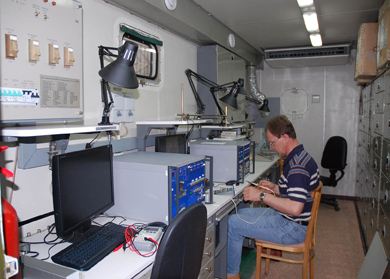 The diagnostic complex consists of hardware, software and repair databases for the tested LRUs. · Providing LRUs under test with power supply. WS-2 (Workstation 2) is the PC-based measuring-diagnostic complex, which is designed to diagnose and measure the high-frequency LRU parameters. WS-3 (Workstation 3) is a multi-purpose workstation, intended for diagnostics of failed cells, assemblies, subunits and units providing switching, check and control, obtaining secondary voltages, processing and onversion of analog signals as part of the radar units and cabinets. WS-3 possesses the built-in facilities of protection, control and check of its main parameters. WS-4 (Workstation 4) is a multi-purpose repair station. 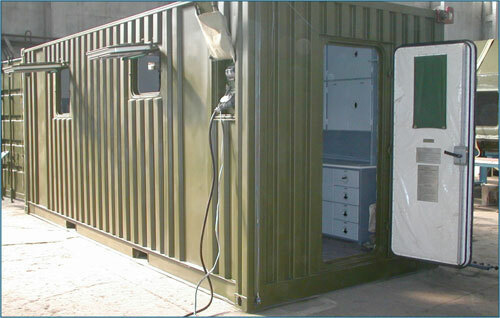 It is equipped with a set of fixtures, tools and special-purpose equipment.